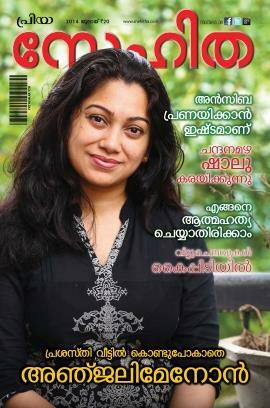 Priya Snehitha malayalam magazine July 2014 issue is now stands. If you wish to read Priya Snehitha magazine July 2014 issue, purchase a copy from your nearest book vendor. The highlight of this issue include exclusive chit chat with actress Ansiba Hassan, film maker Anjali Menon, actress Shalu, articles on how to avoid suicide and handling home expenses. Priya Snehitha, one of the popular magazine has issued its July 2014. The major highlights of this issue include exclusive chit chat with actress Ansiba Hassan, film maker Anjali Menon, actress Shalu, article on how to avoid suicide and handling home expenses. Readers can best use this issue to know more about the inner stories of their favourite celebrities. Ansiba, the young actress who rose to popularity after appearing in the movie Dirshyam shares her thoughts with the readers about her acting career and personal life. Ansiba Hassan speaks much about her private interests and taste. Filmmaker Anjali Menon, who is on cloud nine talks about her movie and its journey to success. The director is ready to share the success of the blockbuster movie 'Bangalore Days' with the entire crew who worked behind it. The movie which is running successfully in theatres has already won the hearts of family audience. Anjali speaks on the team work which really smoothen the road to its grand success. Insightful articles on 'how to avoid suicide' and 'handling home expenses' would provide much awareness to handle matters with care. Positive & optimistic visions can reduce the negative complexes and give a second living to people who have a wrong view about their life. 'Priya Snehitha', a substance taking to young women and family audience has already become a part of the life of the women community in Kerala. Other than regular columns, this issue of Snehitha is packed with various articles on Family, relationship, women's security, shopping, career, religion, people, cooking, beauty tips, film news relationships, travel, women's makeup tips and tips to live life at its fullest. Published by Kalakaumudi, this magazine is well liked by the women in Kerala who wish to follow the absorbing tips offered. Being one of the most favourite magazine among the family readers, Priya Snehitha is also read by celebrated persons who keep updating content of each issue even during their busy schedule. Printed in multi coloured pages, 'Priya Snehitha' designed with perfection it is not strictly a women's magazine but widely read by men also. The magazine which comes at an attractive price tag can fit the bill. I your July 14 issue I happened to see the the diabetic Ayurvedic preparation in which you mentioned one item called ULLI VITHU. What is exactly it is ?can you tell me what it is.where it can be available .to my e mail.unarikot@yahoo.co.in.thank you.